The Top 5 Rewards Cards for Points & Perks! top 5 Rewards cards: Our team of 7 travel experts spent weeks researching 42+ different rewards cards, comparing their welcome bonuses, benefits, perks, and fees…so you don’t have to! We’ve narrowed this list down to these 5 cards below. Want To See Pre-Approved Cards Offers Tailored To Your Credit Score? What was helpful about this? What information was missing? This is Alex Miller, founder of Upgraded Points and I wanted to personally thank you for coming here today! I don’t know what gets you excited, but experiences are everything to both me and my wife. For a long time, I’ve been maximizing the benefits, perks, and points of a select number of rewards cards…so that I can globe trot the world like a celebrity, all on a shoe-string budget. Just recently, in fact, I surprised my wife Erin with an around-the-world trip to Germany, Singapore, Australia, and the Middle-East. The trip would have cost $55,226 USD but instead, I used points earned from rewards cards and paid just ~$1,086 per person in taxes & fees. 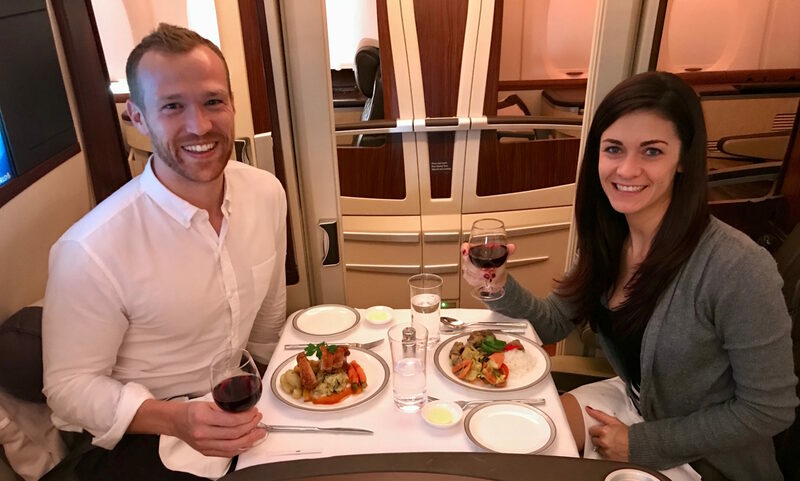 This is a picture of Erin and me onboard a Singapore Airlines flight to Singapore in their First Class Suites cabin, loving every moment of our 6-course fine dining meal. Can you believe this is on a plane?! copy me!Fly Singapore Suites (see above) just like we did by redeeming the points earned from using the Chase Sapphire Preferred Card® — or if you’re a business owner like me, the Ink Business Preferred Card as well. 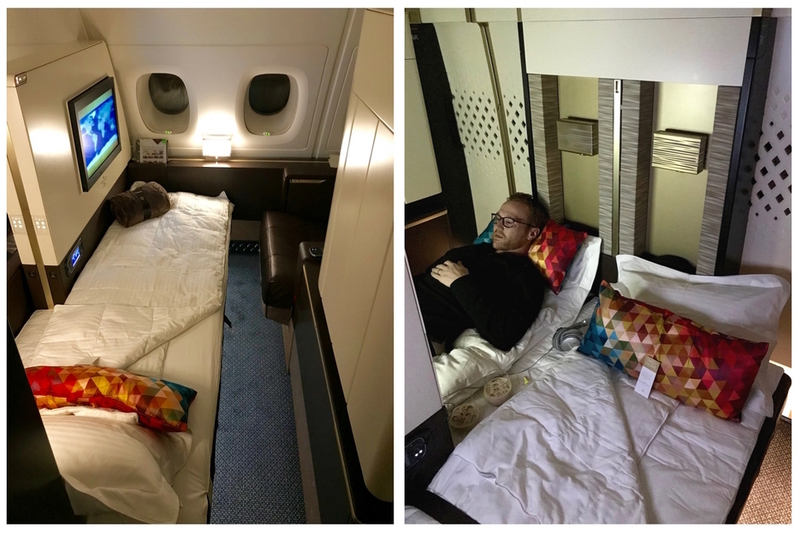 They call it the Etihad First Class “Apartment” for a very good reason! We were blown away by how much space there was for a passenger; this is surely even better than flying Private! copy me!Fly Etihad’s First Class Apartment (see above) like we did by using points earned from the American Express® Gold Card or The Platinum® Card from American Express. One of the most compelling reasons to hold a travel rewards credit card is to fund your travel goals, and one of the most valuable ways to accomplish this is to earn Chase Ultimate Rewards points. That’s because Chase Ultimate Rewards Points are easy to earn, offer flexible redemption options, and increase in value when redeemed through a premium Chase credit card such as the Chase Sapphire Preferred® Card. You’ll earn a sign-up bonus when you complete the required initial spending on the card, and then you’ll go on to earn 2 points/$1 on every travel and restaurant purchase you make. When it comes time to redeem your Ultimate Rewards points — whether you’re transferring your points to hotel/airline partners, or using the Chase Ultimate Rewards travel portal to book your own travel — the experience will make you a fan forever. Bottom Line: You can’t go wrong beginning your travel-rewards journey with any Chase credit card that earns Ultimate Rewards points. The Chase Sapphire Preferred® Card is an especially fine first choice because it allows you to redeem your points for 25% more in value. Keeping track of bonus spending categories, quarterly registrations, and complicated redemption processes may have deterred you from securing a travel rewards-earning credit card. If that’s the case, you’ll find the Capital One® VentureOne® Card travel rewards card refreshingly simple. You’ll earn 1.25 miles/$1 with your VentureOne Rewards Credit Card on every purchase, every day. No need to wonder which category of expenses earns more than others — you’ll earn the same on any purchase you make. It’s that simple! There is one exception to the flat-rate everyday earnings that I’m sure you can embrace. Need to book a hotel? You’ll earn 10 miles/$1 when you book via the hotels.com/venture travel site. Then, when it comes time to redeem your rewards, you can simply sign in to your account and select the travel purchase you want to erase with your miles. You’ll receive 1 cent per mile in value. Done deal! Or, you can these points to one of Capital One’s airline partners which they recently just announced and will be launching in December 2018! This gives you lots of options for using your rewards! When you prefer the best travel experiences, you want only the best travel rewards credit card. And if you’re an international traveler who won’t settle for anything less than a nice comfy seat, lounge access, and premium travel perks/benefits, you’re going to want the Platinum Card® from American Express. The benefits of the Platinum Card® from American Express collectively create a stunning package of everything a luxury international traveler needs to elevate their travel experience. The Best Travel Earnings: With the Platinum Card® from American Express, earning valuable Membership Rewards points is simple. Make your flight and prepaid hotel purchases through American Express Travel and you’ll earn 5 points/dollar spent. The Best Lounge Access: Whether you want to visit a Delta Sky Club, a Priority Pass lounge, or treat yourself to a Centurion Lounge visit, your card will grant you access. Savor Those Upgraded Hotel Rooms: Enjoy the benefits of complimentary hotel elite status with Hilton and Starwood/Marriott. The Best Seat on the Plane: Use your Membership Rewards points to purchase your business or first class flight, and receive 35% of your points back as a rebate. Make Checked Luggage Fees Disappear: With $200 in incidental airline fees reimbursed each year, there’s no worrying about checked luggage fees or other incidental airline charges. Take Uber for Free: Each month you’ll receive a $15 statement credit toward Uber purchases. In December, you receive $20. No Reservations? No Problem! : Just call your own private concierge. Ease Through Security: Purchase Global Entry or TSA Pre√® and receive a statement credit of up to $100. Enjoy Those Hotel Perks: Stay for 2 nights at a Fine Hotels and Resorts property and receive a room upgrade, $100 property amenity, late checkout, and more. Bottom Line: The Platinum Card® from American Express sets the standard for a premium rewards travel credit card. If its benefits are some you can use, the value will far exceed the annual fee. Enjoy the complimentary hotel elite status that comes with the Platinum Card from American Express. Image courtesy of Hilton. Want a card that doubles as an everyday spending card and a travel rewards card, all in one? Get richly rewarded with the American Express® Gold Card which offers a stellar 4 Membership Rewards Points for every purchase at U.S. supermarkets and U.S. restaurants! As a traveler, there’s no need to be loyal to 1 airline — with the American Express Gold Card, you’re going to earn 3 valuable Membership Rewards Points for each dollar spent for flights purchased directly from the airline and at American Express Travel. You don’t need status with your favorite airline to enjoy the perks of free checked bags or other incidentals, since your $100 statement credit each calendar year will take care of these travel-related costs. When it comes to hotels, you can book a 2-night stay at an American Express Hotel Collection property and receive a $75 hotel credit that can even be used toward an extra night. Continue to use your card while traveling internationally too! You won’t be charged foreign transaction fees. You can also redeem those Amex points for travel on any airline, any hotel, and for other travel purchases at American Express Travel. Back at home, your Membership Rewards points are adding up fast with more earnings from your everyday spending. Everything you need to know about the American Express® Gold Card, its additional benefits, and how to book travel through the Amex Travel website can be found in our expert guides. Where the Ink Business Preferred℠ Credit Card really shines for small business owners is the ease with which it allows you to earn tons of Chase points quickly. Thanks to a number of bonus categories, you’ll be booking an award flight before you know it. The bonus categories of this card include travel, shipping, internet, cable, phone, and advertising on social media and search engines. You will earn 3X points per dollar on the first $150,000 spent across these categories per year. Think about that: if your small business spends a combined $150,000 in a year in these bonus categories, you would earn 450,000 Ultimate Rewards points. That’s easily enough points to book Lufthansa first class or Singapore Airlines first class…and still have plenty leftover to redeem for award stays at some great Hyatt properties. 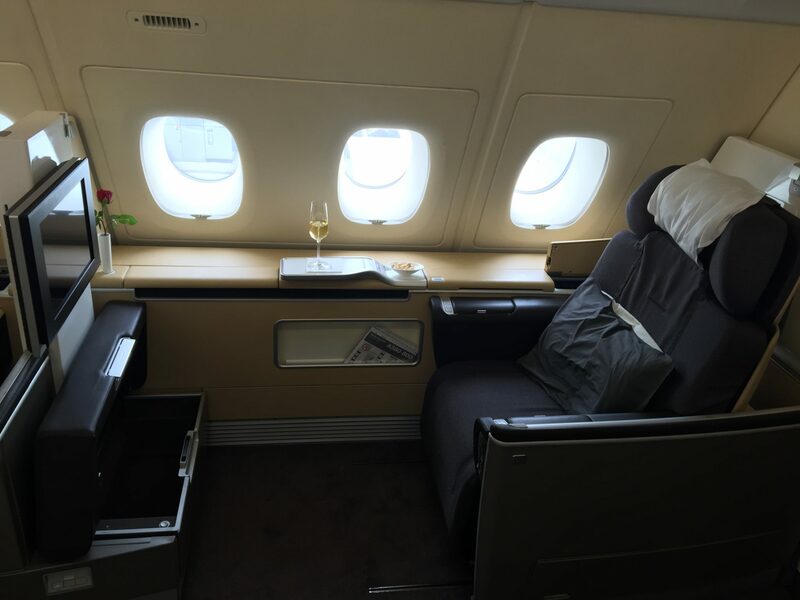 Utilize some fantastic bonus categories to earn an amazing trip in Lufthansa first class. Hot Tip: The Ink Business Preferred℠ Credit Card comes with a big sign-up bonus, so make sure you hit the minimum spend requirement within the allotted time (often 3 months) to ensure you receive the bonus. Check the current offer to see the latest sign-up bonus available.